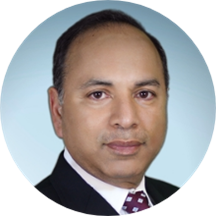 Rahul Malhotra, M.D., F.A.C.C., F.S.C.A.I. has more than 25 years experience in cardiovascular medicine with expertise in advanced/complex coronary intervention, carotid artery, deep vein thrombosis management, peripheral vascular intervention and treatment of varicose veins. Dr. Malhotra is board certified by the American Board of Internal Medicine, Cardiovascular Disease and Interventional Cardiology. He did his fellowship at Brown University Integrated Hospitals, Miriam Hospital in Providence. He completed his internship and residency in internal medicine at State University of New York in Brooklyn and his Doctor of Medicine at St. George’s University School of Medicine in Grenada, West Indies. He is a graduate from Fordham University in Bronx, New York. Dr. Malhotra believes that service is joy and that sleep is a major component to a heart healthy life. “We must optimize sleep and optimize health to live a better life physically” says Dr. Malhotra. Healthfinity is the future of lifestyle health. Instead of separating your healthcare needs amongst a variety of unconnected providers, at Healthfinity we will provide one center, one village where you can address all your health and wellness needs. Dr. Malhotra’s vision is that all Healthfinity patients will be diagnosed, treated, and guided to discover both preventative and therapeutic solutions to each individual’s needs. This integrated approach will bring clarity and eventually empowerment needed to lead a lifelong path of optimized wellness. Dr.Rahul is amazing. He gave me time to talk to him. He had great concern what is going on with me. I am lucky to find him. I am a new patient and probably expect more than I should from a first visit. Awesome. Professional. Understanding. Addressed my concerns with intelligence, compassion and active follow up. I had my check in papers completed on the your internet site and told them at front desk but I had to do them again. Other than this I was completely happy with my appointment. Very knowledgeable! Trust his judgement. The doctors and staff are very attentive and helpful. My only complaint is the wait time, which was to be expected as my doctor is also a surgeon and was travelling between locations. I highly recommend Dr.Malhotra. He listened to whatI had to say and made me feel just as important as his other patients. He's a very nice Doctor. I feel he knows exactly what he's doing. Dr. Rahul Malhotra, MD, FACC, FSCAI has no appointments on Zocdoc right now.